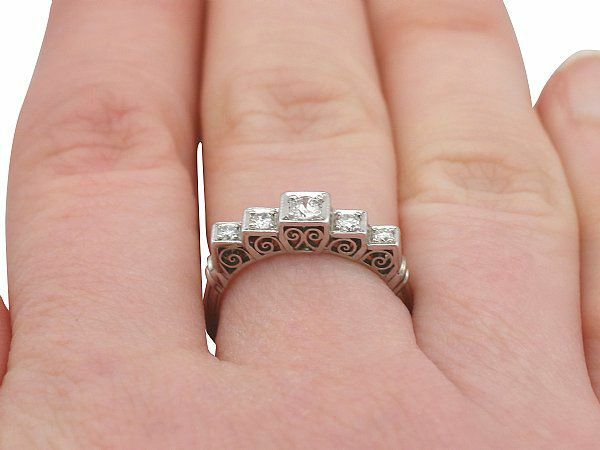 This fine and impressive graduated five stone diamond ring has been crafted in 18 ct white gold. The pierced decorated, stepped design is ornamented with five individually pavé set transitional modern brilliant round cut diamonds, graduated in size. The sides of the setting have a pierced decorated scrolling design. The elevated ring shoulders have a lobed design and integrate with the main setting, melding with the plain multi-stranded shank. This antique 1930's five stone ring has been independently tested using state of the art technology (Niton XL2 Analyzer) and verified as 18 ct gold. This impressive stepped dress ring is fine quality set with very well colour matched, very high colour graded diamonds.